Thought we'd get started with a graph. Seems like a good eye-catching way to begin the topic at hand. This graph depicts the frequency with which Chief Justice John Roberts voted with each of his colleagues (on the same side, that is) in the "defining decisions" of the last term--the Court's 2007-2008 term. Recall that these "defining decisions" are 15 particularly revealing ones which were identified previously. (See GRAPH-ic Total Recap - Supreme Court's 2007-08 Term: The Defining Decisions (Discrimination+Cultural Issues+Law & Order+Political Process), Nov. 26, 2008, and the several preceding posts in that series which are cited therein.) These decisions dealt with "hot button" matters that typically divide the Justices--just like they divide the rest of us--along political, philosophical, and cultural lines--i.e., discrimination, cultural issues, law and order, and political process. 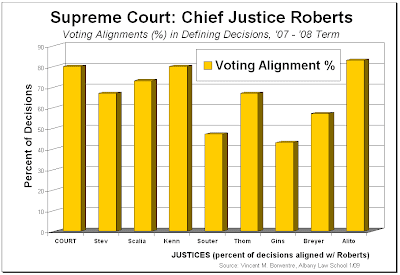 Graph #1 shows the percentage of those "defining decisions" in which Roberts was aligned with each of the other Justices. For the next several posts, let's focus on one Justice at a time. Let's look at voting alignments--i.e., the frequency with which each Justice voted with each of the others. Let's also identify the cases in which the Justice in question broke ranks with his usual ideological allies--e.g., the decisions in which a typically conservative-voting Justice voted with the typically liberal-voting Justices and/or for the more liberal side of the Court's division on an issue. Together, the voting alignments and the "breaking ranks" will tell us a lot about each Justice. E.g., the Justice's usual allies, the strength of those alliances, and the kinds of issues which supersede those alliances and on which the Justice takes positions that diverge from his/her normal ideological leanings. Roberts' alignments can be grouped quite readily. Highly aligned with--i.e., he saw eye to eye a lot with--Alito (83%; 12 1/2 out of 15 decisions) and Anthony Kennedy (80%; 12 out of 15), and then Antonin Scalia (73%; 11). Minimally aligned with Ginsburg (43%; 6 1/2) and David Souter 47%; 7), and then Steven Breyer (57%; 8 1/2). So Roberts was highly aligned with 2 conservatives, Alito and Scalia, and with swing voter Kennedy. He was minimally aligned with 3 liberals, Ginsburg, Souter and Breyer. Interestingly, Roberts aligned equally with liberal John Paul Stevens and conservative Clarence Thomas (67%; 10). In short, what seems most telling, is that Roberts aligned the most with the somewhat moderate conservatives, Alito and Kennedy. He aligned the least with strong liberals Ginsburg and Souter. Additionally, Roberts did not align with staunch conservative Thomas at a very high rate. In fact, no higher than he did with Stevens, who is a pretty consistently liberal vote on the Court. 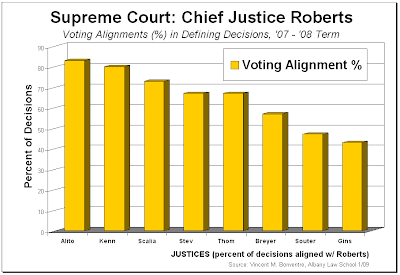 Now let's take those same voting alignments, but replace the percentages depicted in the first 2 graphs with the actual number of decisions (out of the total of 15) in which Roberts agreed with each other Justice. 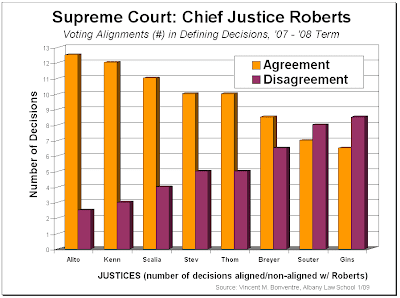 Let's also include non-alignment figures--i.e., the number of decisions in which Roberts disagreed with (and voted differently than) each of the others. First, here's with the Justices in order of seniority, and including the Court as a whole. And now, here it is reorganized, with Roberts' alignments in descending order. The value of re-depicting the data this way in these last 2 graphs is the visual contrast it provides between the frequency of Roberts' agreement and disagreement with each of his colleagues. The graphs make vivid that Roberts agreed with some Justices much more than he disagreed. And with others, he disagreed almost as much as he agreed. 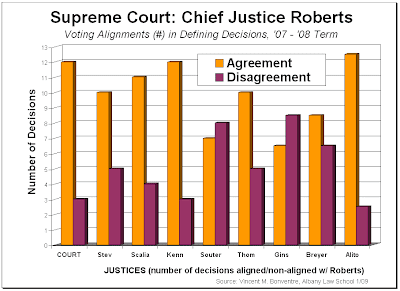 Depicting the data this way in these 2 graphs also visually underscores the fact that Roberts did have a not insignificant (ok, significant) amount of disagreement even with some of his ideological allies. So, for example, he disagreed with Thomas fully 1/2 as much as he agreed with him. And he disagreed with Scalia almost as much. This leads us to the other important matter to cover in this post. On what cases--more pointedly, what kinds of issues--did Roberts break with his usual allies and take a position somewhat atypical of his normal ideological leanings. In short, on what issues did he break with conservatives and vote with, and more like, a typical liberal Justice. With Roberts, there were 6 "breaking ranks" cases (actually, 4 + 1/2 + 1/2) among the 15 "defining decisions." And they seem to have a pretty clear common thread. But then there are the "discrimination" decisions. And there are 3 others: one categorized as both "cultural" and "law & order," one only as "law & order," and one as "political process." Indeed, the possibility of discrimination is present in all but one of these cases in which Roberts broke ranks. And even that one exception, dealing as it does with the death penalty, has at least the inseparable racial implications. Among the decisions specifically categorized as "discrimination," Roberts broke with the conservative Justices and voted with the liberals in CBOCS (a claim against an employer for retaliating because of a racial discrimination complaint), Snyder (racial discrimination in jury selection), and Federal Express (an age discrimination lawsuit after an unheeded informal request to the EEOC for remedial action). He voted in favor of the claimant in each of those cases, and in doing so he took the opposite side from Scalia and Thomas. The other 2 decisions with discrimination implications were: Kimbrough ("law & order"--upholding a sentence below the harsh guidelines for crack cocaine [n.b. the racial implications in the typically disparate treatment for crack versus powder cocaine]), and Crawford ("political process"--upholding a state voter identification law, but only on its face, thus allowing a future showing of discriminatory administration and impact; as opposed to Scalia, Thomas, & Alito who argued that such laws were justified period, regardless of possible incidental burdens; Roberts' vote in this case counts as 1/2 "breaking ranks"). The last case--the apparent exception to the common thread of discrimination--was Baze ("cultural" & "law & order"--upholding lethal injection only because not shown to cause unecessary suffering; as opposed to Thomas & Scalia who argued that only the most barbaric punishments such as drawing and quartering and burning alive would offend the Constitution; Roberts' vote in this case also counts as 1/2 "breaking ranks"). So there are the Roberts' "breaking ranks" votes. Of the 6 "defining decisions" involved, 5 clearly dealt with discrimination. The 6th involved the death penalty--again, never too far removed from concerns of disparate racial treatment. And in all 6, Roberts took a position at odds with the more conservative side of the issue in question. So Roberts' record is generally quite conservative and he can be expected generally to vote with his colleagues on the right wing of the Court. On the other hand, where a case raises serious concerns about discriminatory treatment--and especially racial discrimination--Roberts displays a more liberal leaning and he frequently splits from his usual conservative allies. In the next post in this series, we'll take a look at the Court's senior associate Justice--John Paul Stevens, one of the Court's more liberal members.